This is the same hack as in the color picture but from a different angle, the good looking picture was taken by putting the hack in my scanner and scanning it off the glass.. this one was taken with the digital camera. 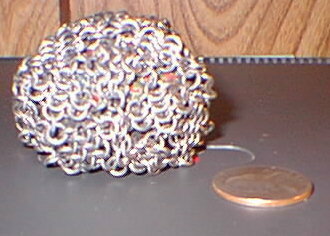 This hack is made with the Japanese 6 in 1 weave out of 16ga 1/4"ID stainless, and stuffed with a ball of cloth. Same hack as above but without the stuffing. Stuffed ones have a little bounce, which makes them a little easier to kick; empty ones are easier to stall and I think they react a little more like a normal hacky sack. This hack was originaly made as an experiment, it's just breaking out of it's testing period and people seem to like it, so I'm offering it for sale. It is similar to "Ball #1" which is further down on this page (slightly different design but similar weave). It is made from 16 gauge 1/4"ID and 18 gauge 1/8"ID stainless steel, and is filled with short chains aluminum rings (16 ga, 1/4"ID). 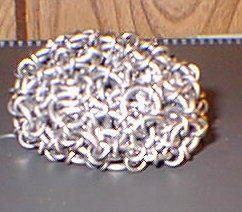 The filling of aluminum chains gives it a weight and feel that is very similar to a cloth hacky sack. This was another experimental hack design. 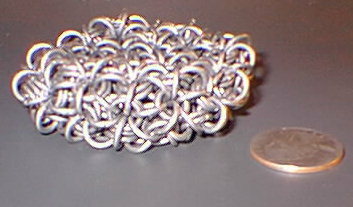 Although it passed it's testing and all, it takes way to long to make and sell for my normal price of $30... next one will prolly be about $50 and I don't really think this design for a maille hack is worth that much but thats what I have to charge for the amount of work that goes into it. But, while I have this one already made, I'll sell it for $30. 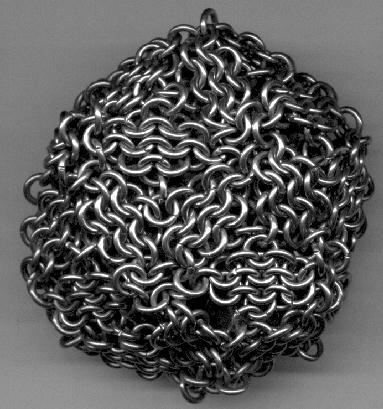 Another picture of Experimental Chainmaille Hack #3, this one is a little clearer because the hackysack was scanned directly in my scanner. 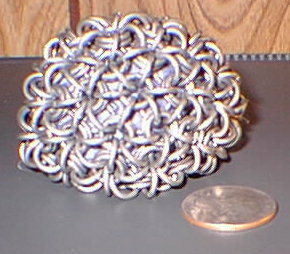 it's certainly the most unique chainmaille hacky sack I've ever seen and I prolly won't make another. This ball is made from a variation of the Japanese 4 in 1 weave which turns into a seamless sphere. For a filling material in these balls I use a cloth hackysack or I can fill it with those colored glass things that look like melted marbles. I can get most colors except for red. 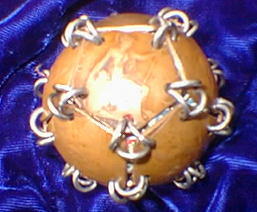 I could also fill this type of ball with smooth round stones if you are worried about the glass breaking or just like stones more than glass. Filled with the glass things or with smooth stones this ball makes a unique ball for juggling or tossing on your coffee table. The ball pictured above is filled with green glass 'lumps'. The large rings, which can either be made with 16 gauge Stainless Steel or Brass, have an inner diameter of 1/4". The smaller Stainless Steel vertical rings have an inner diameter of 1/8th of an inch. 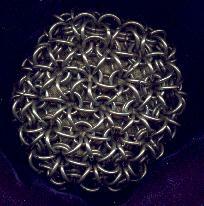 All my coin balls are made from foreign (foreign to the US) coins that are linked together with chainmail rings. The two pictures above show a couple different ways I link them together... The coins (old Brittish pennies)in the ball in the first picture have the sides trimmed down so they can be linked together in a way that forms a much harder ball. This ball would make a good juggling ball, paper weight, sling bullet, or just an odd thing to stick on a shelf so people will ask you what it is and you can tell them that you really don't know... just don't try it for a hack cause you could break something.